Isometric sci-fi adventure Divide is set to hit PlayStation 4 in the new year. Shacknews decided to visit its strange new reality while at PlayStation Experience. Imagine receiving a mysterious package, only to find that it contains the key to a completely different world. That's the general story behind Divide, an isometric science-fiction dungeon crawler and the debut effort from Exploding Tuba Studios. But while the story focuses on the sci-fi future, the game appears to be an homage to the top-down isometric adventures of the past. Shacknews went hands-on at this year's PlayStation Experience. Divide focuses on a man named David, who mistakenly receives a strange package from an organization called Vestige. The package contains an orb that sends him into a completely different augmented reality. And while David has no idea what's happening, Vestige wants that orb so much that they've abducted his daughter in an effort to get it back. 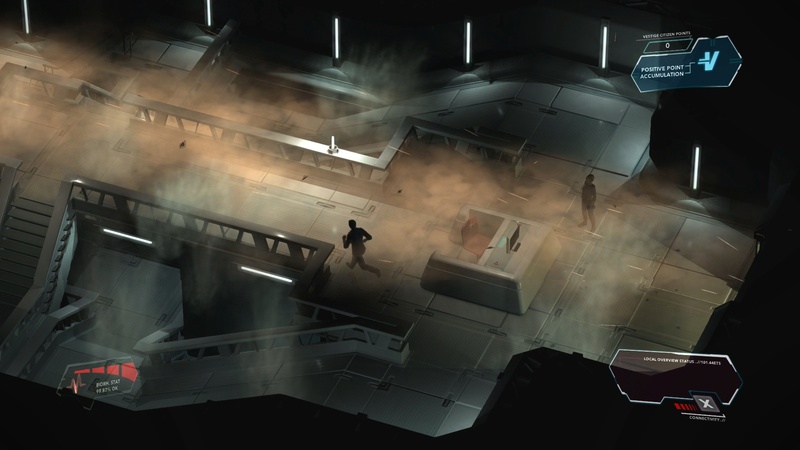 The demo from PlayStation Experience took place across a scientific facility, with Vestige guards on patrol. While Divide isn't exactly a stealth game, it's definitely beneficial to approach it like one. That's because David isn't a soldier or hardened tough guy, but rather an average man. He does have ways to defend himself, mainly a futuristic stun taser (the E-Laser) as his sidearm. Divide plays like a twin-stick shooter, with players able to aim with the right stick and pull the right trigger to attack. The problem is that David can only take a couple of hits before going down. Since it doesn't help that attacks feel slightly delayed and weapon fire attracts unwanted attention, the stealth route quickly proved itself to be the best one. There's another key element to Divide and that's hacking. David can hack into terminals to open up new paths forward, which include both main and secret paths. He can also utilize certain terminals to set traps for guards or send them off in a completely different direction, allowing him to escape unseen. While combat is an option, Divide seems to be a more rewarding experience when played nonviolently. There's far more to the Divide narrative than what I got to check out at PlayStation Experience, with dialogue, lore, and choice-driven conversations strewen throughout the game. It moves the story forward, but also challenges the player to think about what the "truth" behind the narrative really is. It won't take long for the Divide story to unfold. The game is set to hit PlayStation 4 on January 31 before coming to PC. The Ozzie is coming from inside the Shack! So does the demo level take place in the Augmented Reality World, or the Real World? Or a mix of the two (back and forth)? Or overlaid? Or is the AR a Tool you can use? How much Crusader No Remorse/Regret feel is in this?